Radiant heaters are widely used to provide space heating for factories, warehouses, supermarkets, sports centres, factories, and other buildings containing similarly large spaces. Commercial radiant heaters contain a gas or oilfired burner that is employed to heat a tube, cone or plaque that emits infrared radiation when hot. This infrared radiation is then directed downwards by the incorporation of heat reflectors within the unit. Powrmatic radiant tube heaters may be installed in either vented (flued) or unvented (unflued) mode however specific regulations and requirements apply for the safe evacuation of flue gases. 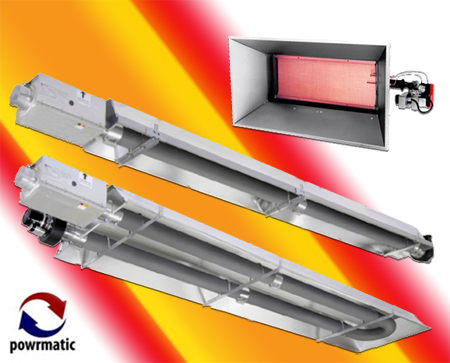 Powrmatic radiant plaque heaters are smaller than tube heaters but are just as efficient in providing economical and viable heating solutions for large units.